I consider audio an inclusive hobby. Sure, there are myths -- often propagated and perpetuated by audiophiles themselves -- about the price of admission to the world of the high end, but rest assured: if such prices exist, theyre probably not as high as many believe. True, $500 probably wont go too far toward assembling a complete high-end system, but as readers of GoodSound! are aware, you dont need to make a doctors salary to afford a high-quality stereo system. A growing number of companies are building products that can give you more than a taste of what the very best products have to offer for a fraction of the price. 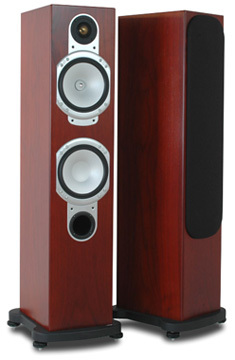 One example is Monitor Audios Silver RS6 loudspeaker ($999/pair USD). Like Bowers & Wilkins (B&W), Monitor Audio is a brand synonymous with the British loudspeaker industry. Founded in 1972, Monitor made its mark with the R852MD, the first speaker to use a metal-dome tweeter composed of an alloy rather than a single elemental metal. Since that time, Monitor has been a firm proponent of metal-based drivers. Today, that technology finds its place in their Ceramic Coated Aluminum Magnesium (C-CAM) drivers, first introduced in the Silver S series. The tweeter used throughout the newer RS line is based on the C-CAM Gold Dome used in the companys more upscale Gold series. The floorstanding RS6 is a ported, bass-reflex design with two 6" C-CAM drivers for the bass and midrange reproduction. The 6" cones cast-polymer chassis help damp the residual energy produced by the movement of the drivers. In this two-and-a-half-way design, both 6" drivers contribute to the bass, but only the upper one extends into the midrange; it crosses over to the tweeter at 3kHz. The ports, one each on front and rear, help increase the weight of the low end. Should that bass weight prove too much, port plugs are included -- a nice touch that allows the user to fine-tune the speakers sound to the room. I used them, as youll see below. Monitor claims the Silver RS6s frequency response to be 38Hz-30kHz, its sensitivity an efficient 91dB, and its nominal impedance 6 ohms -- it should be relatively easy for an amplifier to drive. Monitor also says that the RS6 can handle up to 120W RMS of amplification, and suggests using an amp that can output at least 40Wpc. The cabinet itself measures just 33 7/16"H x 7 1/4"W x 9 13/16"D; attaching the plinth adds an inch of height and expands the RS6s footprint to 10"W by 12"D. Each speaker weighs about 35 pounds. Included are four sturdy, adjustable levelers that screw into the bottom of the plinth to couple the speaker to the floor. The RS6 comes in a Video Silver finish, as well as a choice of real-wood veneers -- black oak, natural oak, rosenut, walnut, cherry -- of a quality not commonly offered at this price point. The review pair were finished in walnut and looked very sharp. In fact, seeing them for the first time, my girlfriend was especially impressed by their rich appearance. She loves music and appreciates good sound, but in the past has harshly criticized the appearance of some of the components that have taken up residence in my listening room. That she immediately liked the RS6 speaks well for its design, and is good news for other audiophiles who might need to consult their partners before investing in new equipment. The RS6 looks as if it costs much more than it does. For this review I used a Simaudio Moon CD5.3 CD player, my NAD C372 integrated amplifier, AudioQuest Copperhead interconnects, and Nirvana Audio Royale speaker cables, terminated in spades. At first, I thought the Monitor Silver RS6 sounded too aggressive, with far too much emphasis in the bass. Although it sounded big and the highs were crystal clear, the bass was muddled, and the presentation lacked depth. As usual, I experimented with placement and found that in order to eliminate the overpowering bass and hear convincing three-dimensional sound, I needed to position the speakers farther from the room boundaries. They ended up 32" from the front wall -- considerably more than the 8" Monitor suggests starting with. I then plugged the rear port of each speaker and left both front ports open. These changes significantly improved the bass balance. One of the first discs I popped into the CD tray was Erlend Øyes DJ-Kicks [CD, Studio !K7 !K7161CD], specifically Øyes very cool version of The Smiths "There Is a Light that Never Goes Out." Through the RS6 the bass on this track played with authority and control, easily filling my room without ever becoming loose or bloated. Øyes voice was well delineated among the various elements of the musical backdrop, seeming to almost float above everything else. I was amazed that such a relatively small speaker could sound so big. This factor alone will likely sway some listeners toward the RS6 -- after all, many of us lack the space for huge speaker cabinets, or might live with someone who views them as eyesores. This should be less of an issue with the svelte RS6; while fairly compact, it manages to move a huge amount of air. Aside from my surprise at the weight of its low frequencies and the overall large scale of its sound, what impressed me most about the RS6 were its reproduction of highs -- they soared effortlessly from those C-CAM tweeters -- and its exceptionally clean sound. When I listened to Neil Youngs latest album, Live at Massey Hall 1971 [CD, Reprise CDW43327], Youngs detailed voice projected from his seat to give a clear sense of the acoustic of Massey Hall. With this recording and others, the RS6s managed to pull voices forward more than any speaker Ive encountered, to make the space around voices and instruments more open and natural. The same spaciousness was equally evident on Alice in Chains Unplugged [CD, Columbia 67703], where the band was spread across a deep, wide stage that extended beyond the outer edges of both speakers as they played one of their last shows, in the Majestic Theater at the Brooklyn Academy of Music. The only other time Id heard a Monitor Audio speaker was in a dealers showroom, with entirely unfamiliar ancillary components -- so I couldnt judge the speakers themselves. The Silver RS6 was thus the first Monitor Id ever seriously listened to, and by this point I was surprised and impressed with its performance, and found myself digging out album after album. I inserted Martin Sextons Black Sheep [CD, Kitchen Table KTR-003] and pressed Play. The title track begins with an acoustic guitar whose strings sounded crisp and clear through the RS6. The guitar was simply "there," and so was I. When Sextons voice entered, I couldnt help but be drawn into the sonic illusion that there were musicians actually performing there in front of me. However, as good as "Black Sheep" sounded, I was even more impressed when I heard the next tune, "Glory Bound." Again, it was Sextons voice and the RS6s lucid midrange presentation that absorbed me in what I has hearing. As his falsetto soared, the reverberation of his voice made the space around him sound immense -- but more remarkable was how he managed to fill it. Reminding myself that I now had a floorstanding speaker in my room capable of exploring a few two-digit frequencies my own bookshelf speakers cant reach, I listened to DJ Shadows exceptional Endtroducing [CD, MoWax/A&M 540 007-2]. On "Building Steam with a Grain of Salt," the RS6 played with excellent speed and control. Furthermore, its tight bass was very punchy, vitalizing the music and making it move. On "The Number Song," this intensifies as the music takes a decidedly more uptempo turn and demands that the volume be turned up -- so I did. The RS6s easily handled it. They played loud -- I know that I never approached their limit. Thats good news for those who try to play music at rock-concert levels. Surprisingly, despite how low and how loudly it could play, the RS6 also had an uncanny ability to allow me to listen deeper into the minute details of recordings, to hear things that would otherwise be sunk beneath the noise floor. For example, the voices heard during the opening of "Kings Crossing," from Elliot Smiths From a Basement on a Hill [CD, Anti- 86741], were audible earlier in the track through the Monitor Audios than Id ever heard them before. I loved how easy it was to "see" into the music with the RS6s. I compared the Monitor Silver RS6 to PSBs Platinum M2 ($1999/pair), the latter companys flagship bookshelf model and my own reference. Some may think the comparison unfair, given the disparity in price. However, the differences in performance between the RS6 and M2 werent as great as the price gap might suggest, and in a few areas I could easily imagine some listeners preferring the less expensive Monitor. The lone 6.5" mid/bass driver of the two-way M2 was unable to compete with the RS6s low-frequency output, even with one of the latters ports plugged -- the PSB was no match for the Monitors sheer weight and impact. One example was the War Dance, from Eiji Oue and the Minnesota Orchestras recording of the Suite from Respighis Belkis, Queen of Sheba [CD, Reference RR-95CD]. Through the M2, the fierce cacophony of the war drums was very fast and highly detailed. Switching to the RS6, the speed and tautness of the drums remained, but the added weight made the experience much more visceral, as the pounding rhythm and drive propelled the dance forward. The dual 6" drivers and larger cabinet volume of the RS6 not only resulted in meatier, more chest-thumping bass, but also made the Monitors sound more dynamic with some of the electronic and classical music I love. The two speakers mids, too, were different, though in this regard I give the nod to the PSB M2. On "Twilight," from Elliot Smiths Basement, the RS6 gave more warmth to Smiths acoustic guitar, making the body of the instrument seem bigger, but less precise and immediate. In contrast, the M2 was clearer, and revealed more details of resonance of the instruments wooden body, making the guitar sound more natural and realistic. Although the M2 didnt convey the degree of overall weight and scale that the RS6 did, it maintained a firm grip on the music, sounding tight and precise. As for the highs, the Monitors 1" C-CAM tweeter was a close match for the 1" aluminum dome of the twice-the-price PSB. I preferred aspects of both. Although the RS6s tweeter lacked the complete ease and velvety smoothness of the PSBs, the Monitors top end had an energy and a clarity that brought to life much of the music I asked it to reproduce. In contrast, when I switched back to the PSB, it sounded almost dull by comparison. Overall, there were important differences in the voicings of these speakers. Whereas the PSB M2 sounded very neutral, almost bland by comparison, the Monitor RS6 had a more forward, more room-filling presentation from the bass all the way through the robust mids and the energetic highs. Ultimately, I prefer the M2s more restrained sound, but I did find the RS6s bass thrilling. I know that some listeners will prefer the more forward, room-filling Monitor, which bodes well for its value, given that it costs only half as much. My belief that audio is an inclusive hobby is reaffirmed when I encounter a product such as Monitor Audios Silver RS6 -- a relatively inexpensive, exceptionally well-built floorstanding speaker that provides considerable insight into what the best has to offer. Obviously, when it can compete well against a speaker costing twice its price, it must be considered an excellent value. The RS6 proved to be a good speaker -- a really good speaker. Its sound was distinctive, its presence readily felt. It played big and bold as it approached the peaks of crescendos, softly and delicately as it traced the decays of piano notes. Its reproduction of all types of music was superb, and its command of everything played through it was almost beyond reproach. The marketplace for speakers costing under $1000/pair is fiercely competitive, and each year seems to raise the bar for what one should expect for less than a grand. The Silver RS6 costs a mere $1 under that, but if youre in the market for a new floorstander, youd be cheating yourself if you didnt at least audition Monitor Audios Silver RS series, and particularly the RS6. It could be the last speaker you buy for a very long time.